NURTUREart is pleased to present Call and Response, a group exhibition curated by Kelly Rae Aldridge and featuring artists Salome Asega, Sophia Brueckner, Ornella Fieres, Sam Lavigne, and Mendi + Keith Obadike. Call and Response explores how we speak to our machines and how our machines speak through us. The pulse of communication, measured in clicks, clips, and sound bites, makes it difficult to discern what is being said and to whom. Much of what we express through technology is conveyed by lines of code, but their impact on how our utterances move through space is often opaque. How do we parse these substrates of communication? One way is to peel back technological paraphernalia to their most basic processes: input / output, post / comment, call / response. In the call and response, one voice addresses many, and many voices respond as one, creating a circuit between the participants through which knowledge and experience have been shared for centuries. Each artist in this exhibition investigates this circuitry and how it moves through our technologically mediated present. Through the movement of sounds and voices across and along the gallery walls, Mendi + Keith explore how both music, narrative, and data reverberate through physical and social space. A cover of the African-American spiritual Battle of Jericho, spoken folk tale fragments, and search data related to Black Lives Matter play through special wall mounted speakers that vibrate the walls of the gallery, sonifying the architecture itself. Sam Lavigne uses digital automation to deconstruct US government-created video training manuals that instruct immigration candidates in the “correct” response to a suite of questions used to determine whether or not they can enter the country. Video automation draws phonemic linkages between each examiner, demonstrating how the Q&A, by institutionalizing language of inclusion and exclusion, reinforces borders. Ornella Fieres uses data analysis to transform found mid-twentieth century photographs into frequencies rendered as flares of light that are inextricably bound to their analogue source. When a computer translates this data back into an image, the original photograph echoes through the digital recast. Fieres pairs these photographs with video montages in which early television’s fascination with its own apparatuses — tools for capturing and broadcasting images — become both the subject and agent of their own remediation. This excavation of the past continues through a series by Salome Asega. 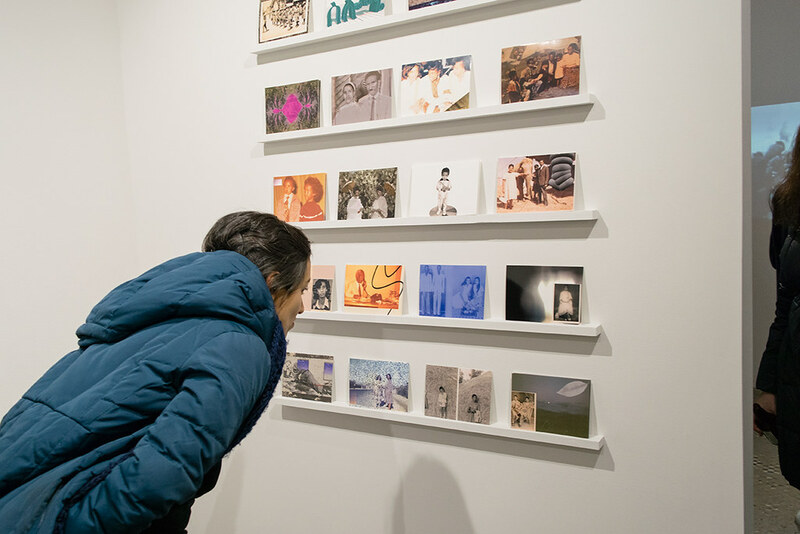 Beginning with a box of photographs belonging to her grandparents, Asega encodes the memories, locations, popular culture, etc., that get passed from one generation to the next into her family archive. She uses digital collage as an interface between intimate and global histories, which she then returns to her grandmother as postcards, reasserting their physical and personal context. Sophia Brueckner also examines intimacy, in this case one drawn between herself and the computer. Inseparable from computers since the age of three, this series of programs and videos represent a period of personal disenchantment and later reconciliation with code. She sings C++ instructions that tell a program to run the recording of her instructions, creates a generative software that sings its own code, and captures her own frustrated breakdown by a dictation machines as it fails to understand her. Through moments of poetic alignment, cacophonous rupture, and the steady hum in-between, Brueckner explores the power and limitations of our increasing enmeshment with machines. Kelly Rae Aldridge is a doctoral candidate at Stony Brook University in Art History and Criticism. Her dissertation, Of Cabbages and Kings: Hospitality and Hostility in Participatory Art, situates contemporary socially engaged art in a lineage of rituals obligating one to receive, shelter, and nourish others. She is a Visiting Professor at Pratt Institute and Stony Brook University. In addition, she writes about time-based media and acted as the founding curator and director of programing for The Current Museum of Art. She is a member of NEW INC, where she is developing an educational curriculum that pairs computer science with studio art. Salome Asega is an artist, researcher, and current Technology Fellow at the Ford Foundation. She is co-host of speculative talk show Hyperorpia: 20/30 Vision on bel-air radio and the Director of Partnerships for POWRPLNT, a digital art collaboratory. Salome has participated in residencies and fellowships with Eyebeam, New Museum, The Laundromat Project, and Recess Art. She has given presentations at NEW INC, Performa, Eyeo, and the Brooklyn Museum. Salome received her MFA from Parsons at The New School in Design and Technology where she also teaches. Sophia Brueckner is an artist, designer, and engineer, and self-identified cyborg. Previously a software engineer at Google and Google Research, she designed and implemented products and experimental projects within Google Research. Brueckner’s work has been featured internationally including at SIGGRAPH, ISEA, the Peabody Essex Museum, the Bemis Center for Contemporary Art, the Urban Institute for Contemporary Art, and the Leaders in Software and Art Conference in New York. She is an Assistant Professor at Stamps School of Art & Design at the University of Michigan – Ann Arbor. Breaker received a Sc.B. in Computer Science and Applied Mathematics from Brown University, an MFa in Digital + Media at the Rhode Island School of Design, and an MS in Media Arts and Sciences from MIT Media Lab. Ornella Fieres was an inaugural Science Sandbox @ New Lab Fellow through the Simons Foundation and grant recipient from 1822-Forum Frankfurt. She is represented by Sexauer Gallery in Berlin, and serves as a board member of SALOON, a network for women in the arts. Fieres’ work has been featured in PANTA Magazine, Frankfurter Allgemeine Zeitung, Spex, Exberliner, Juxtapoze Magazine, Frankfurter. She received her Diplom in Visual Communication from Hochschule für Gestaltung Offenbach. Sam Lavigne is an artist, programmer, and educator. He has exhibited at Lincoln Center, SFMOMA, Pioneer Works, DIS, Ars Electronica, The New Museum, the Smithsonian American Art Museum, and his work has been covered in the New Yorker, the Washington Post, the Guardian, Motherboard, Wired, the Atlantic, Forbes, NPR, the San Francisco Chronicle, the World Almanac, the Ellen DeGeneres Show and elsewhere. Sam is an Adjunct Professor at ITP/NYU, The New School, and the School for Poetic Computation. Mendi + Keith Obadike make art, music, and literature. They have exhibited and performed at The New Museum, The Studio Museum in Harlem, The Whitney Museum of American Art, The Metropolitan Museum of Art , and The Museum of Modern Art. Their projects include a series of large-scale public sound art works: Blues Speaker (for James Baldwin) at The New School (commissioned by the Vera List Center for Art and Politics with Harlem Stage), Free/Phase at the Chicago Cultural Center and Rebuild Foundation, and Compass Song (commissioned by Times Square Arts). Their recent gallery exhibitions include Numbers Station [Furtive Movements] at RYAN LEE Gallery, NYC and the group show Electronic Superhighway (2016-1966) at The Whitechapel Gallery, London. Their honors include a Rockefeller New Media Arts Fellowship, Pick Laudati Award for Digital Art, a New York Foundation for the Arts Fellowship in Fiction and the Louis Comfort Tiffany Award Biennial Award. Featured Image: Ornella Fieres, The Essence of a Moment / Inverse Fourier 4, 2017, C-Print.